Are You Truly Addressing What Is Holding You Back? On last week's blog Working Hard: More Mental Skill than Mental Toughness we discussed how the mental skills required to train and race to your potential can be learned and perfected rather than being something that only 'tough-guy' elite athletes can do. This prompted some really interesting discussion on the comments section of the post from people who'd tried working a little harder and reaching a little higher as a direct result of the post. We also received some great thoughts from more experienced athletes sharing their experiences and suggestions of how to enter that state of flow known as 'the zone'. Thanks to all of you who posted comments - please keep them coming! These mental skills are 'in the moment' of a race or training session but what about the choices you need to make in the months and years before a big race so that you put in a lifetime best performance? 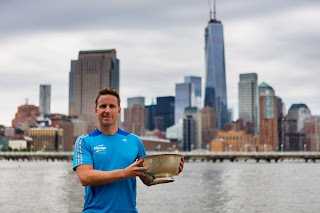 Since Paul Newsome won the Manhattan Island Marathon Swim on 8th June we've had a lot of emails asking for more information on Paul’s 'swimming journey' towards this win, particularly in the light of having a full time job and young family to care for. How did he manage to perform so well and beat all the young full time professional swimmers? "My problem is I'm not like those other guys, I'm not really tough enough." Have you ever thought this, or said it out loud? If you are relatively new to swimming it's very common to feel this way, especially if you don't have a background in another endurance sport. It can be very disheartening to see other swimmers working through training sets without any undue stress while you feel you are in a world of pain. Swimming at race pace is hard work as the feedback from your muscles and lungs is urging you to stop. Without knowing how to cope with this situation, the experience can be very overpowering and stressful. The good news is that sustaining a strong effort isn't so much about pain tolerance or developing some sort of iron-will, it's actually a mental skill that you can learn. The trick is to shift your focus away from the feedback your body is giving you and keep it on the movements of swimming itself. Notice we used the word 'feedback' not 'pain' because when you get this right the stress levels you experience drop and you 'suffer' far less. Can you turn yours off when you swim? Many swimmers (for instance our head Coach Paul Newsome) like to think of this as 'turning the brain off' and this can be a great way of looking at it. Dwelling on how far you've got to swim or discomfort messages from your body does no good at all, you need to 'turn the brain off' from that and simply focus on the movements of swimming instead. If you can do this everything will become much much easier. Saying all that, unless you are completely "in the zone" (see below) there will be occasions during any race or hard training set when your mind returns to the discomfort you are experiencing. At these moments the self-talk you use is very important to steer you back into that non-thinking state as quickly as possible. If you think "god this hurts" then you have associated the pain with the movement in your mind. But if you change that thought to "OK, I'm getting some feedback now" then you are recognising it as only part of the situation, not the whole situation. This separation of the movements of swimming from the messages your body is sending you is critical to help you cope. When the effort hits you, try thinking "I can do this", "stroke it out" or "smooth and strong" and immediately switch your focus back to the movements of your stroke. This may sound airy-fairy but it really does work. The right place for your mental focus is on the movements of your stroke itself. This could be your exhalation into the water, tapping your big toes together as they pass or pressing the water backwards during the catch. Or, as many experienced swimmers do, you can simply focus on the rhythm of your stroke. 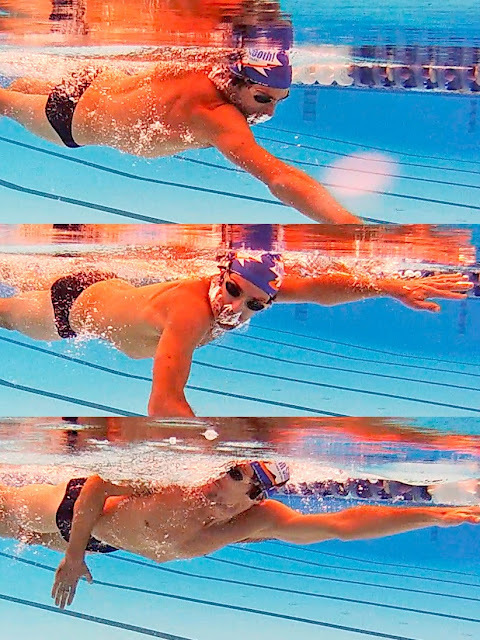 Another powerful way to do this is to visualise a great swimmer in action as you swim. 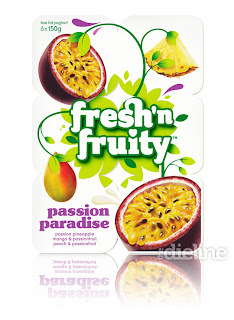 Think about how their whole stroke looks smooth and rhythmical. Watch Jono Van Hazel on your phone before you swim, or if you favour a faster stroke rhythm try this clip of Alistair Brownlee leading at the Blenheim Triathlon at 4:20. Pick just one thing and make sure it's nice and simple, you won't have the mental capacity to think about two things when you're working hard. You're not superman and we're not asking you to do the impossible, so if you set off too fast in your race or training session then you will not be able to sustain the pace, no matter how good your mental skills are. It's important to have a plan for this situation. Up until now you may have caved in and stopped for a rest or resorted to some breast stroke. A much better strategy is to slow down just enough to get things back in control again. It might only be 2-3 seconds per 100m but that can make all the difference and let you re-assert yourself without stopping. Having this as your fall-back plan will still let you do yourself justice in a race or training set and is far better psychologically than having to stop and feeling like you've failed. If you've been following Swim Smooth for a while you'll know we're big fans of CSS type training which involves sustaining a good speed with short recovery times between swims. Sustaining your speed during CSS sessions challenges you in all the ways we are talking about here but if you can learn the skill to cope and perform them well, you stand to make some big strides forwards in your swim fitness. You will also discover that at CSS pace your technique and form doesn't break down like you might have found it did (or been told it would) during hard interval work. We hear swimmers recounting that they "should never practice struggle" but CSS is a pace at which you can safely sustain your stroke technique while making big gains in your fitness. This is especially true if you use a Tempo Trainer Pro to accurately control the speed which you are swimming so you don't start too fast and then blow up. Be very wary of entering a belief cycle that you should never try to swim quickly for fear of your stroke breaking down and then never gaining any swim fitness. You might hope that one day you will wake up a fast swimmer from all the technique work but it's not going to happen without combining it with the right fitness training too. Being afraid to train is a dangerous viscous circle which you can be trapped in for years and years. it too much, they just get on with it. Swimmer: "I didn't realise I could work that hard!" Coach: "What did you think would happen if you tried?" Swimmer: "I guess I thought I would die or something!" Coach: "Well you're still with us! How do you feel now?" We can write a hundred blog posts to encourage you but the only way you are going to believe you can do this is to try it. If you've never done a 'proper' training set before and are not sure you can, just turn your brain off and go for it, that really is all there is to it. Once you have a successful experience you will believe you can do it again: your confidence will blossom, your fitness will improve and a whole new world of swimming will open up before you! The zone is an amazing experience when it happens, it's as if you are nearly on autopilot and despite working hard, you almost don't feel the effort mentally or physically. This is what elite swimmers are really talking about when they recall "effortless swimming" and it all starts with developing the right mental skills to work hard. Enjoy Prague this August whilst your kids improve their swimming! Newflash: Following on from Paul Newsome's win in the Manhattan Island Marathon swim a few weeks ago, Swim Smooth Coach Emma Brunning won the Brighton 10K Open Water swim last weekend overall (beating all the men in the field too!). Great job Emma! If you've ever tried swimming with a rubber band around your ankles you'll know it can be hard work. But used in the right way - and with the right focus - it can be an insightful way to help develop your stroke. Swimming with a band isn't supposed to be easy so you have to mentally set aside the difficulty of the exercise. Once you've done that, using a band comes into its own as it gives you immediate feedback as you work on different areas of your stroke. Improve your technique and you will feel the benefits straight away as your legs lift upwards and you pick up speed. In particular it helps develop good rhythm and timing in your stroke, perfect for triathlon and open water swimming in particular. A band (sometimes also called a strap) should lightly fit around your ankles which will hold your feet together, stopping you kicking. It will also add some drag at the back of your stroke, which will pull the feet downwards in the water, making things more difficult than swimming normally. A band tends to pull your legs downwards which in turn can reduce the amount of rotation in your stroke. Higher drag and reduced rotation can increase the load on your shoulders so we strongly suggest limiting the distance you swim whilst wearing one. 8x 50m is a sensible maximum for a single session, even for advanced swimmers. Treat swimming with a band like a drill, swimming over short distances of 25 or 50m at a time. The idea is to swim quickly with good rhythm and focus on areas of your stroke which will stop the legs sinking lower in the water. We suggest starting with 4x 25m with 15 seconds rest between each 25m, building up the distance slowly as you become more competent wearing it. - Make sure you are exhaling smoothly into the water to reduce the buoyancy in your chest and help bring your legs upwards. - Try breathing less frequently than normal (e.g. every 5 strokes) to give you more time to get rid of the air in your lungs. - Stretch through the core, lifting your rib cage away from your hips. This will improve your core stability and hold you higher in the water. More on doing that here. - Point your toes behind you and turn your feet slightly inwards so the big toes touch. - Focus on a good catch, pressing the water back behind you with good rhythm. A poor catch presses downwards on the water (or forwards and away from you), this lifts you up at the front and sinks your legs. 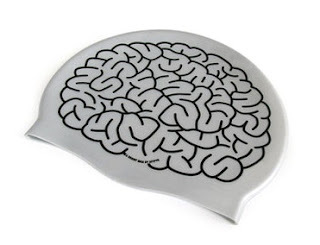 - Swim with a continuous rhythm without any deadspots or pauses in your stroke. A pause will cause you to stall in the water so that you start to sink (you can see this happen in the clip of Paul above). More continuous propulsion overcomes the resistance of the band and keeps you moving forwards effectively, just like it does in open water. Some men (particularly Arnies) have very lean muscular legs that are very sinky in the water. If this is you, try placing a small pull buoy between your legs whilst wearing a band to rebalance you slightly. Make sure it's a small pull buoy though, a large one will make things too easy and give you nothing to focus on to improve, defeating the object of the exercise. 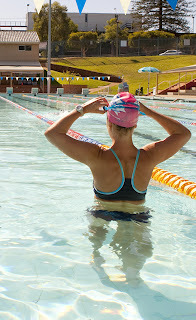 Swimming with a band is a good exercise to add into a drill set or open water skills session. When you become proficient at it you can use bands in group exercises too, drafting close to other swimmers and racing over short distances. It's not easy but can be very beneficial to your swimming, particularly if you want to perform better in open water. 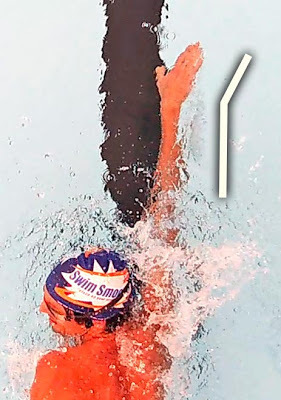 Smooths are very proprioceptive swimmers who normally make changes to their stroke very easily, however they may find these two particular habits hard to break. Be persistent and expect the changes to เกมยิงปลา HappyFishingtake about six sessions before they feel "right".